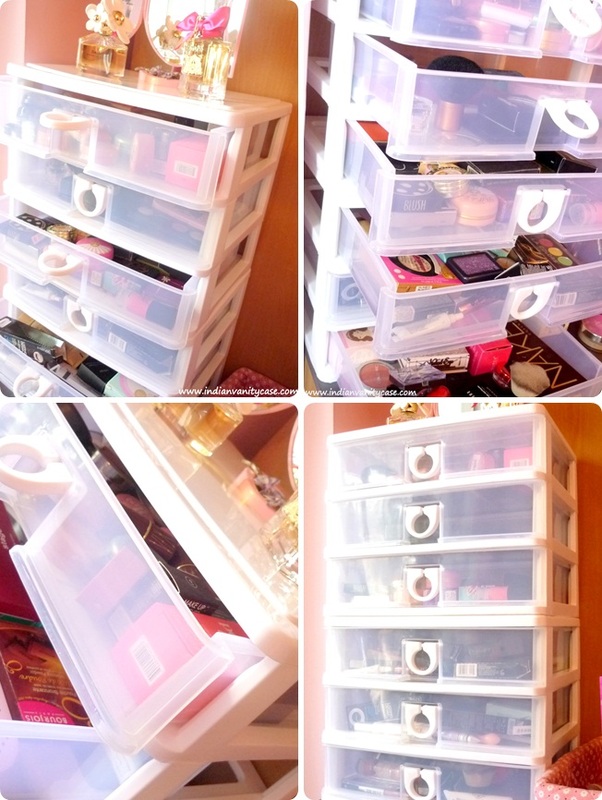 One Saturday, I saw some plastic drawers I've been looking for, but then the white color I wanted was so dirty & old! So the shop owner told us a new one will be available on Tuesday. I ordered 2. I was so excited the whole weekend. Tuesday came, but the idiot didn't have new ones- he'd forgotten all about it. I wanted to scream! And I did- in my pillow, like a lady. They are quite sturdy although they're plastic. The best thing about them is they are made in such a way that you can stack them on top of each other. I still need to organize my products properly, so please ignore the randomness =D. I also don't usually keep them in this place. I shifted them to a brighter room for the photos. Each drawer has space for quite a lot of stuff. I'm very happy with them & I am definitely buying more, coz these babies have de-cluttered my stash quite a bit. Brand ~ Nayasa . They have a website, so if you want some, you can contact them and ask where they are available in your city. U got 2 six storied ones !! OMG..
will have to get more..wud check dis broader ones next time...ur stuff looks awesome..! So much of make up!!! Would you be able to finish them ever ? I so need to buy these. Unfortunately they're not available in the size I want here in Chennai. hi.. does he deal in the acrylic ones too?? the broad 5 tiered drawer sets?? hi.. does he deal in acrylic drawers too?? the 5 tiered broad ones? Oye yar this is so cool! I am using random boxes.. Urban Touch sends some cool boxes so i store those and use those! But i really need these ! u can get It at any plastic shop. evn nilkamal makes them.. Thanks for the post Cynthia. 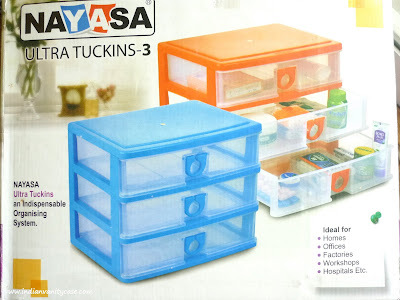 I was actually looking for this kinda storage drawers. p.s. mine are a hideous lime green in color; I just didn't have your patience to wait for the right color to be in stock. D: THIS IS EXACTLY THE KIND OF THING I want / need for my makeup. Whaaa. The draws are awesome. I love the fact that they're clear as well so you know where everything is. Dr.Neeraj- They are from India only. Click on the like I put in Nayasa, and u can contact them and ask where they're available in yr city. They are so cool and reminded me of Ikea ones I have been looking for but never got a hold of. "left to underwear shop" i totally followed the tracks and I think i found it in back of my mind!! thank you.